The issues that arise in the wake of divorce or a complex family law matter are emotional, complex and sometimes overwhelming. During these phases of transition, decisions made can impact you and your loved ones for years to come. For this reason it is critical to work with a law firm that combines a comprehensive competence of family law with an unyielding commitment to aggressively advocacy. These qualities are what we offer to every client. 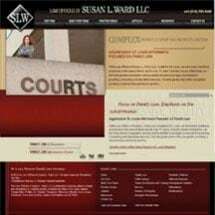 At the St. Louis, Missouri, Law Office of Susan L. Ward, LLC, we have practiced exclusively in the area of family law for more than 20 years. Our law firm approaches each case with a client-centered perspective, and we always work to offer a clear understanding of both the law and viable options to our clients. Because of our approach we are able to answer questions and continually update clients on the status of their cases, while providing support and comfort during what can be immensely challenging times. Regardless of the legal issues you are facing, we at the Law Office of Susan L. Ward, LLC, are ready to bring our experience to help you resolve them efficiently and effectively, while maintaining your financial and emotional well-being.